Family trips are crucial to the Allen Family. We love to enjoy places that are close-by home but still far enough that we can enjoy our getaway. 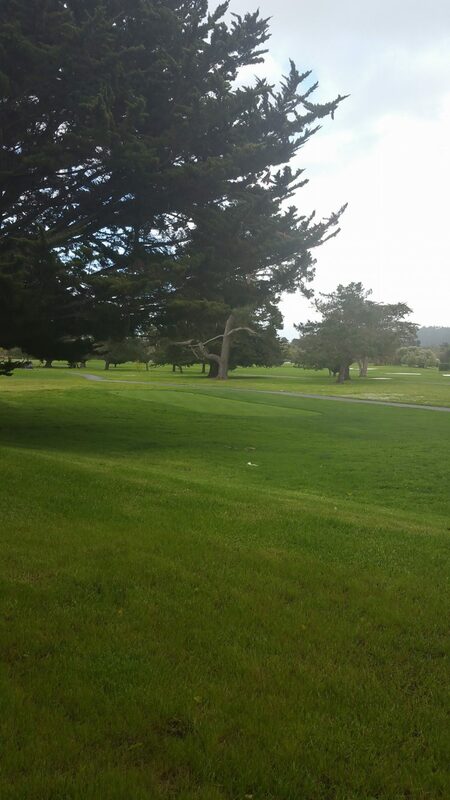 Monterey is a 3-hour drive, and that is perfect for us plus get us out of the busy area of Oakland. We love Monterey for many reasons, and it is our GO TO place for trips. Monterey is the best place to bring the family. So many different things to do and all are family friendly. The beach, shopping, trails, aquarium, and so many cool parks around too. Walking around and seeing all the cool shops is our favorite thing to do too. When we go to Monterey, we stay at the Hyatt Regency because it has everything we need. Beautiful rooms, gorgeous grounds, places to eat, swimming pool, fireplace pit, and it’s close enough to downtown Monetary we don’t have to drive to far at all. The rooms are equipped with everything you need to enjoy your stay. I brought my house computer because I can never get the laptop from the kids and I set that thing right up at the desk, and the WIFI is easy to connect. There were plenty of plugins for all of our electronics- I know on a vacation, but we are a techy family, so we didn’t unplug. Someday we need to do that, though. Oh my goodness, the first night my husband feel in love with the bed so much he fell asleep across the bed, and I couldn’t wake him up so I slept in my daughter’s bed. She didn’t mind one bit. My husband woke the next day and informed me we need a mattress just like we have in the room. I checked into what kind of mattress it was, and he is out of luck- the pillow top mattress is a Hyatt Signature Grand Bed. It is so darn comfy and fluffy. They had plenty of pillows and extra blankets. Want to know something cool- they come and turn back your bed plus leave water bottle to drink before bed. Speaking of water, the front desk told me whenever we need drinking water please ask and they will give us bottles. Wow! Even when we left, they gave us water. The Hyatt knows how to treat their guests with respect and want to make their trip the very best. We like to stay in the rooms that have a view of the Golf Course. We can walk outside, and we are on the green. We watched other guests play while enjoying our room service breakfast out on the deck. It felt so good being out in the fresh air and enjoying the beautiful scenery. I told my step-dad how awesome the golfing green was, and he says next time he comes to town we all will go down there to stay. 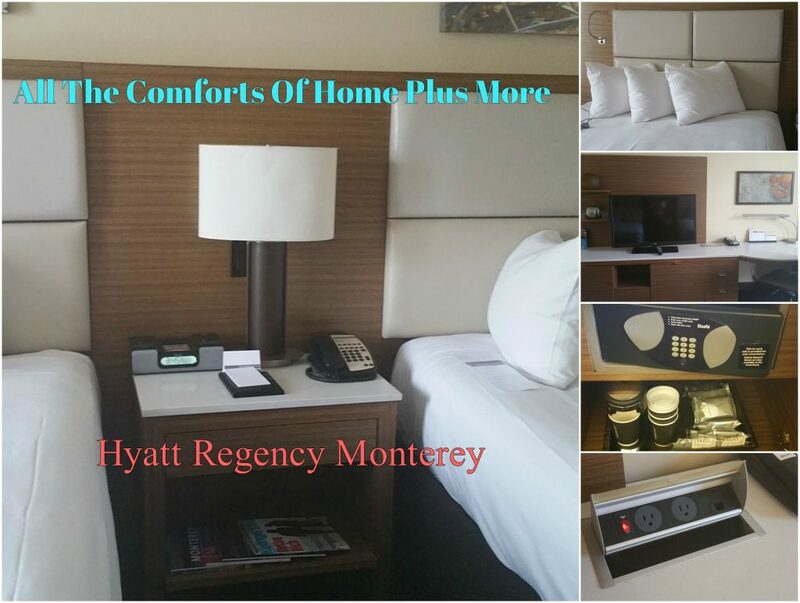 Even though the rooms are worth the stay all by themselves, but there is so much more to the Hyatt Regency in Monterey! The dining that is in the hotel is fantastic, and I don’t’ think I’ve ever eaten so well in my life. Check out my post about the Dining/Amenities (coming soon) at the Hyatt. I had so much to share I had to make two posts! 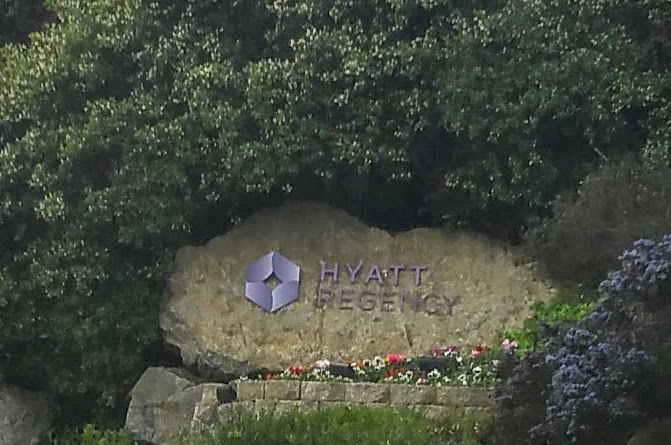 Please check out the Hyatt Regency Monterey for your next trip to Monterey, you won’t be disappointed. 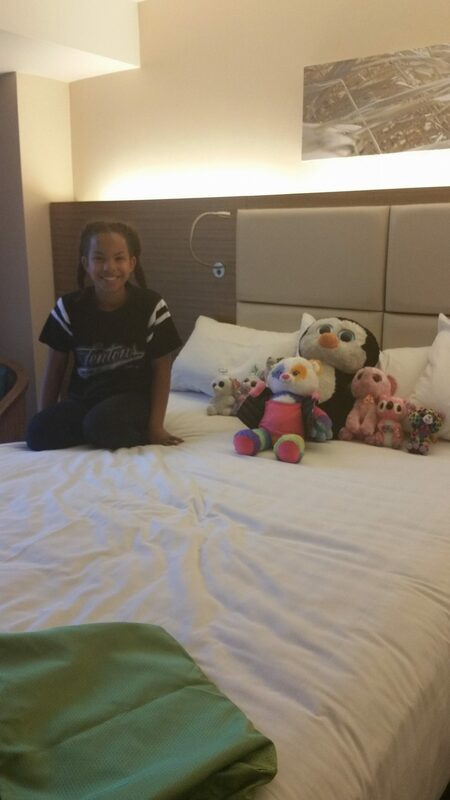 We had so much fun and felt so comfortable there during our trip. Plus the kids enjoyed themselves a lot, next time they want us to go when the pool is open. We will for sure! Thank you, Hyatt, for taking such great care and sponsoring our rooms, meals, and the trip to the Monterey Aquarium. All opinions are mine 100%.